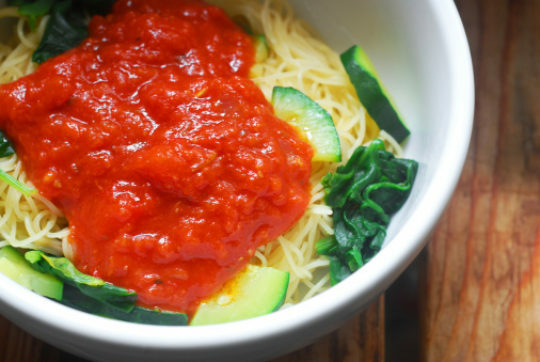 Spaghetti squash gives you the look and feel of pasta for less than a quarter of the calories and carbs. Serve with our healthy, homemade marinara sauce and sprinkle with Parmesan cheese. The perfect dish for the autumn season. Cut spaghetti squash in half lengthwise. Scoop out seeds and string. Coat inside with 2 tsp extra virgin olive oil, salt and pepper. Bake spaghetti squash in 350 degree oven for 35 minutes, insides up. Let cool. Scrape insides out and sauté them in 2 tsp olive oil with cannellini beans and 1 Tbsp garlic. In another pot, heat 2 tsp of oil over medium heat. Add zucchini and mushrooms, onion powder, and remaining ½ Tbsp garlic. Add canned tomatoes and tomato paste. After 10 minutes, turn heat down to low and let simmer for 1-2 hours. Add water as needed to obtain desired thickness. Serve squash mixture topped with sauce. Sprinkle each serving with 1 Tbsp of parmesan cheese.